Do you like Piña Coladas? 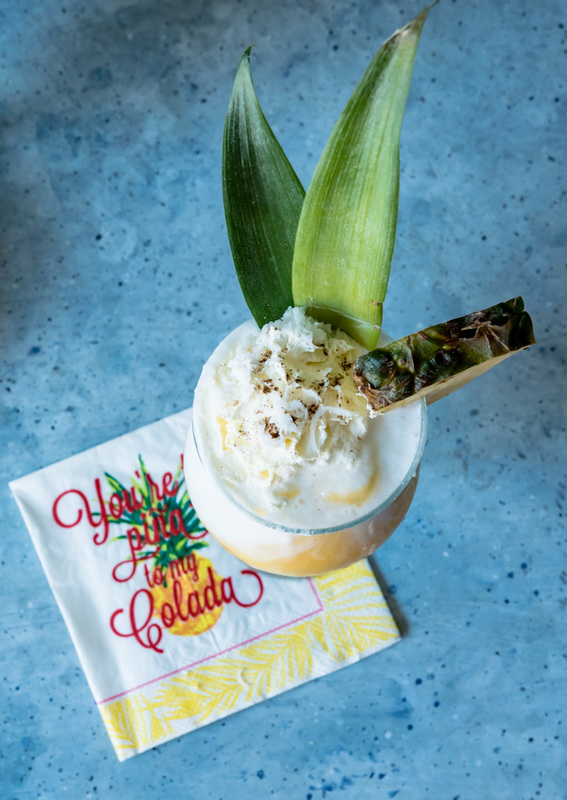 I think if Jimmy Buffet had never sang those words would we even think them every time we saw a piña colada? Things to think about. I will ponder this as I sip on my golden layered piña coladas. 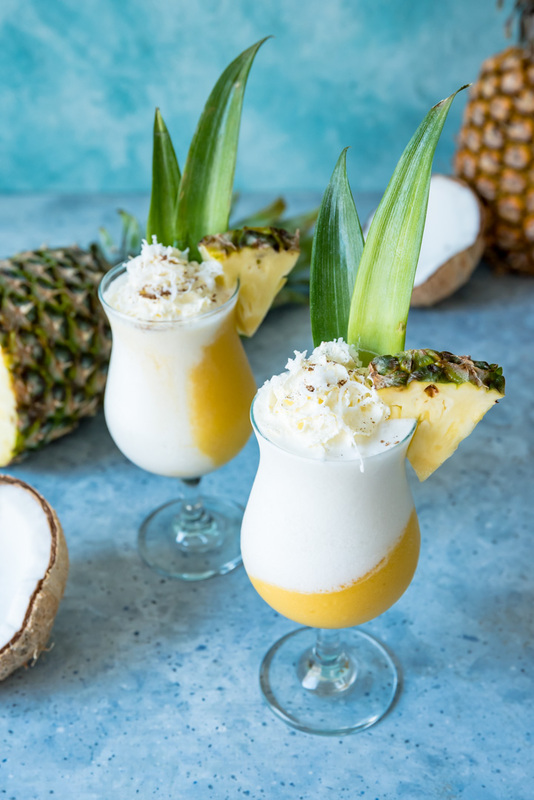 This is my obligatory Piña Colada cocktail post for National Piña Colada day. Not like I NEED a nationally recognized food holiday for one of my favorite beverages, but I will gladly celebrate. Even on a Tuesday. I had originally planned on posting piña colada popsicles. 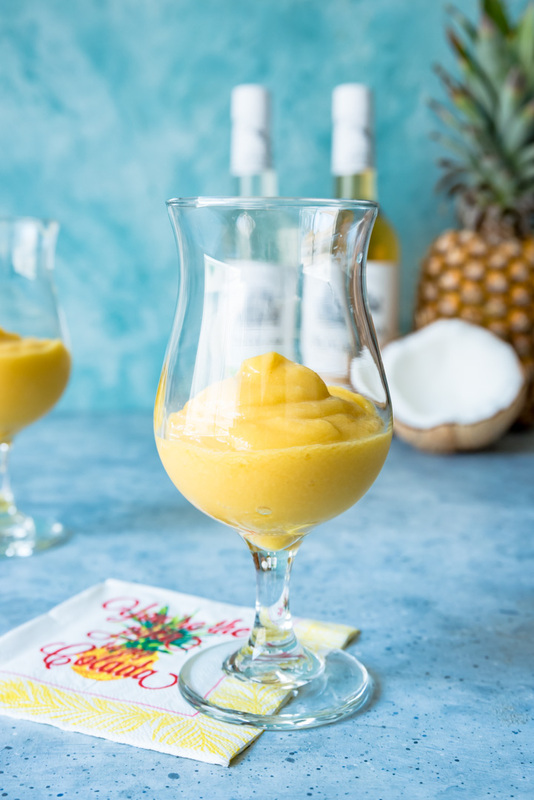 I just got the CUTEST pineapple popsicle molds from Sur La Table on a 20% off sale plus free shipping. I couldn’t pass it by!! But the last two weeks have been so busy I never got around to making them on time for today. I had my younger daughter’s 8th birthday party which I had to make her this elaborate unicorn cake for because that is what she wanted and my two friends in town that are way better cake bakers and decorators than I am were booked out so I had to take on the challenge. Then the next weekend my daughters were in a tennis tournament this past weekend in the blazing 110 deg Vegas heat. They played amazing and ended up battling it out for 2nd and third. The younger sister beat the older sister in a third set tie break. It was so awesome. It was a round robin format so everyone in their group played each other. The one girl that beat both my daughters ended up with first place. All in all an amazing time, even in the heat. But that is it for tournaments for us for the summer. Maybe next summer we will travel to California or Utah for some tournaments in slightly cooler weather. 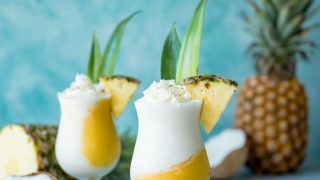 Back to these golden layered piña colada cocktails. I could have used them sitting court side cheering on my daughters to help cool me off in that heat last weekend. I decided to make these slightly layers/swirled instead of tossing everything in the blender like a traditional margarita. I started with frozen pineapple and mango for the golden layer. 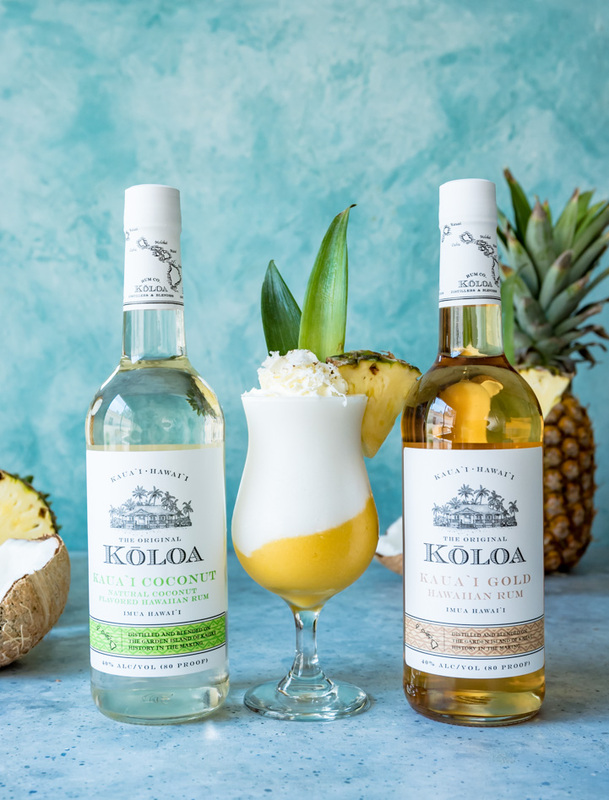 Once pureed I kept in a jar in the freezer until I made the coconut layer with Koloa Coconut rum then layered into the glasses and added garnishes. 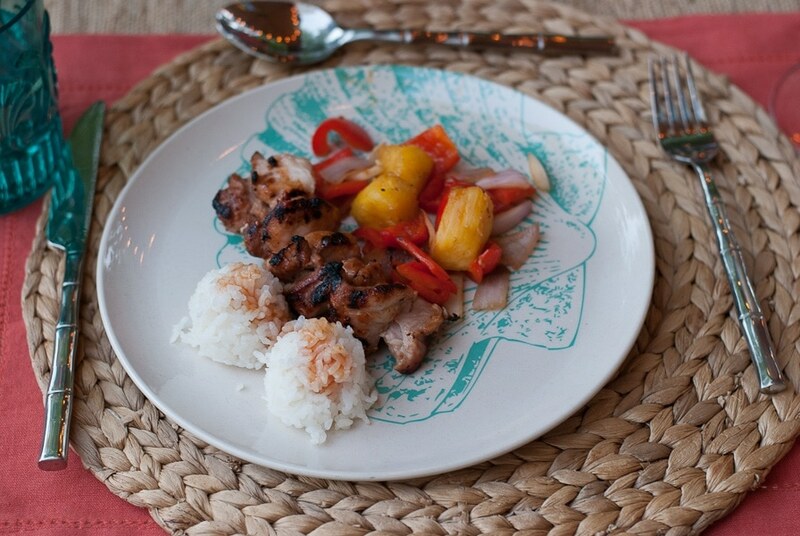 The yellow pineapple and orange mango make for such a fun, golden summer color. To go with this happy color I blended with Koloa Gold Rum. I love the deep flavor of this rum and it goes so well with tropical fruits. For the coconut layer I of course, had to use Koloa Coconut Rum. 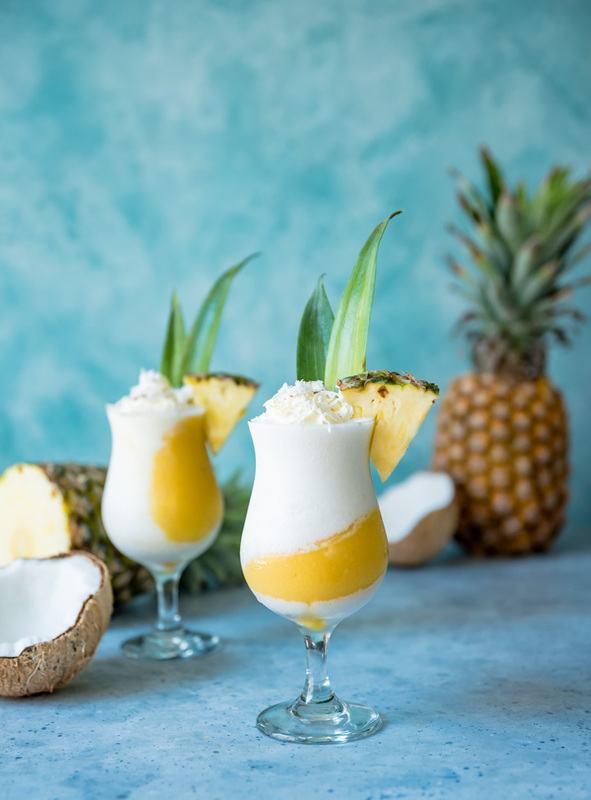 Traditional piña colada cocktails use light rum and you can certainly use light rum instead of the coconut if you would like but I love that extra punch of coconut flavor in these cocktails. 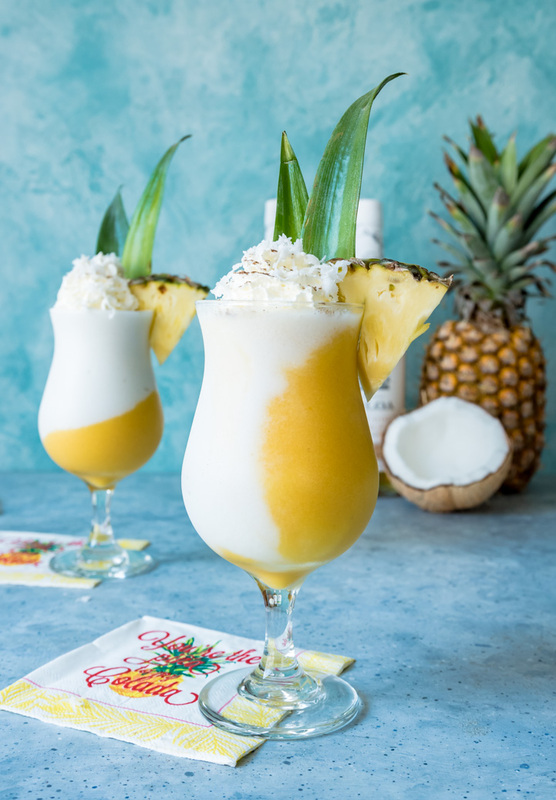 I am a fan of using as much frozen items in blended cocktails to use as little ice as possible because ice tends to take away from the richness of the flavor of the drink. For the coconut part I used ice but I have made these before by freezing coconut milk in ice cube trays the day before. Either way works just fine. 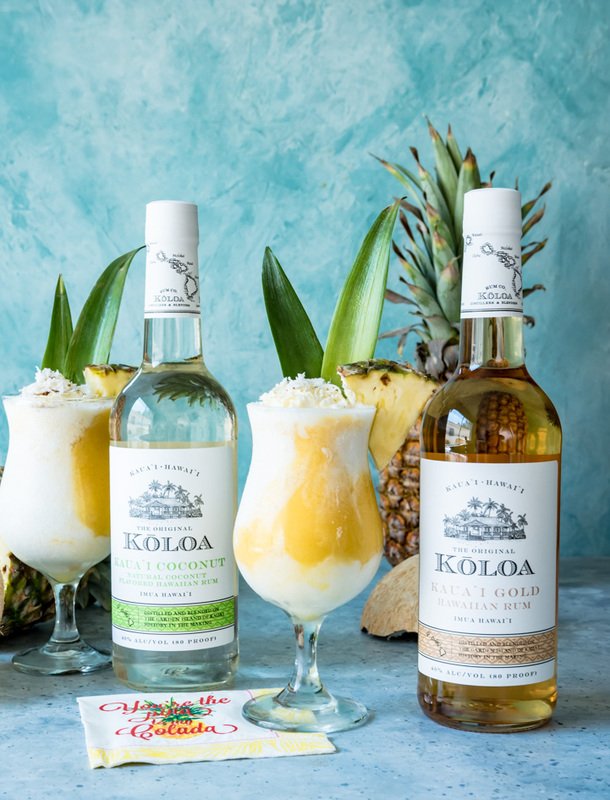 In a blender combine the frozen pineapple, frozen mango, Koloa Gold Rum and pineapple juice. Blend until smooth but still very thick and frozen. 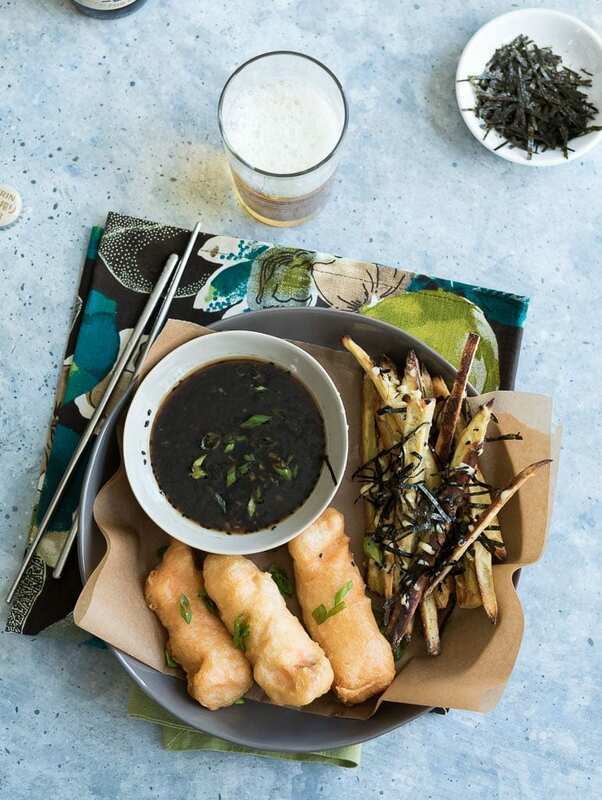 Pour into a large glass or jar and keep in freezer until ready to assemble drink. 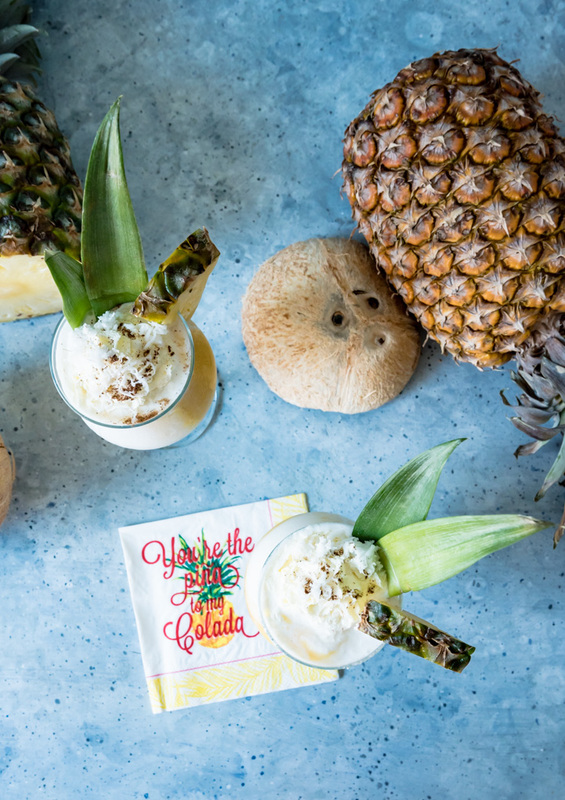 In a Piña Colada hurricane glass divide the golden puree then top with the coconut puree. Stir slightly for a swirled look, leave as is for a layered look. Top with whipped cream sprinkled with a little ground all spice and some freshly shredded coconut. Garnish the glass with a slice of pineapple and a few pineapple leaves. Drunk immediately! 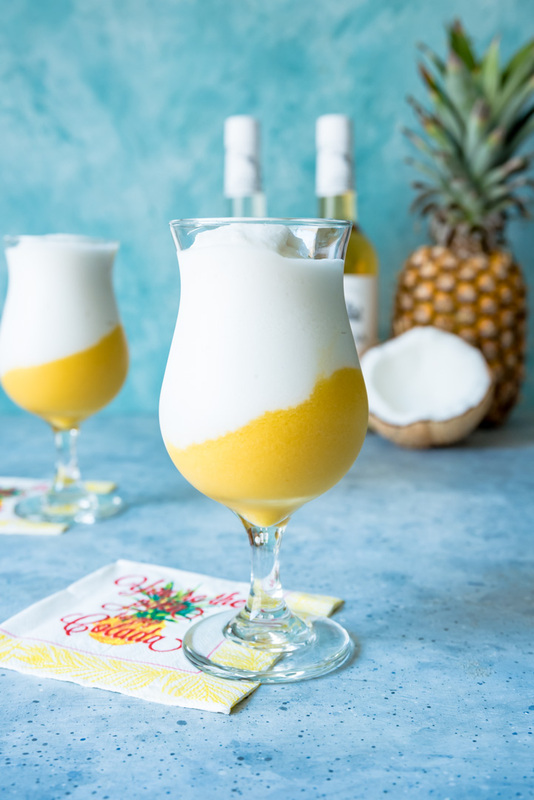 Hope you are staying cool this summer and try these golden layered piña coladas! Where are you buying your Koala Rum? I recently visited Kauai and brought some home but I am unable to find it here in Southern California? 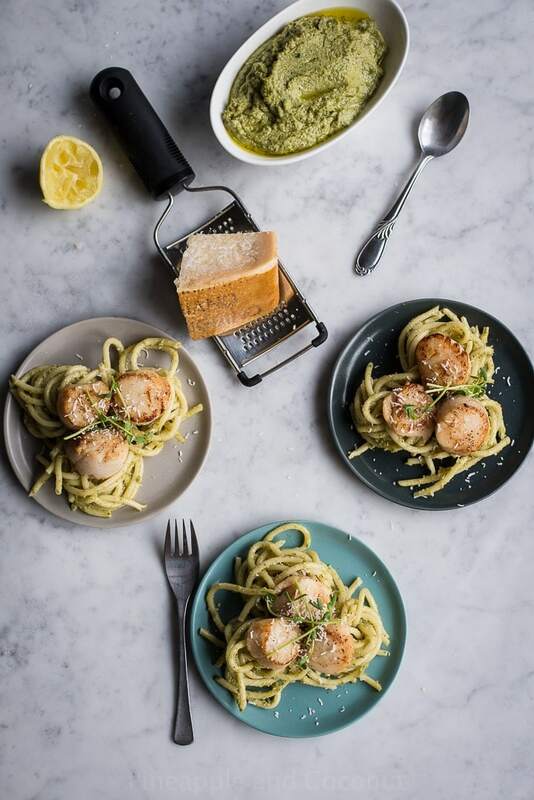 Just watched you on My Family Recipe Rocks.